Ground broke in Dansville for Erie & Genesee Valley Railroad Company line. Later named the Dansville & Mt. Morris Railroad. The Erie & Genesee Valley Railroad was incorporated in January 1868. It was completed in 1872 and leased to the Erie until October 21, 1891, when it was returned to local management as the Dansville & Mt. Morris Railroad. The company operated in receivership from 1894 until September 30, 1927. Passenger service ended in 1939. The company was acquired by Genesee & Wyoming Industries on July 23, 1985. 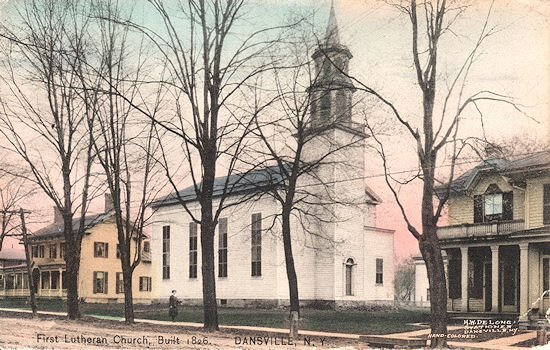 The first constitution was adopted July 4, 1824 when the congregation assumed the name (as translated into English) “The United Reformed and Lutheran Church of Dansville”. Although the Reformed and Lutheran groups worshiped and worked together, each elected its own council and kept separate records. The first Lutherans Church, St. Jacob’s, was built in 1826. Prior to building that church the Dansville congregations (German and English) met in a log school-house. The Church was centered on an early indian burial ground. And it’s said that the stones of an indian burial mound were used in the foundation of St. Jacob’s Church.